It's not often we sympathise with stroppy supermodels, but we actually feel some sympathy for Naomi Campbell today. She's been released on bail after being arrested yesterday at Heathrow after an alleged incident at Terminal 5. BA decided to resolve this by insisting she leave the flight and then called the police to forcibly eject her from the flight. She was taken to the Heathrow police station and released on police bail. 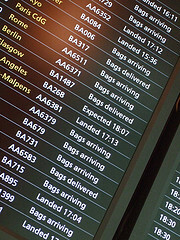 So far as we are aware BA have still failed to offer any explanation as to why her bag went missing at Terminal 5. Still, it is ridiculous that, having checked in with plenty of time to spare, one (not both, just one) of her bags went missing. Surely that's the whole point of tagging bags, isn't it? So, they don't get lost? Perhaps her bag is on its way to Italy, and will have some lovely holiday stories to share with her when it gets back. Of course, T5 has been beset by problems right from the start. Which surprised very few of us, really. We hope they get their act together soon. Or at least before we have to fly in or out of the dreaded terminal.